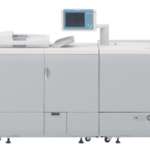 Canon imagePRESS C6010, 6010VP, 7010VP | Welcome to JJ Bender! 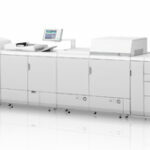 The imagePRESS C6010 produces output that rivals offset quality, maintains superior color consistency, and empowers you to fulfill a wide range of jobs, including saddle-stitched booklets, hard-copy reproductions, direct mail pieces, and marketing collateral. With a true 1200 x 1200 dpi resolution and 256 levels of Grayscale, theimagePRESS C6010 consistently reproduces clear, sharp images with the lifelike skin tones, smooth gradients, and color accuracy needed to satisfy even the most perceptive buyers of printed materials. Building on the incredible reputation of their predecessors, the imagePRESS C7010VP and imagePRESS C6010VP take digital color production to new heights. Even higher print quality, outstanding finishing capabilities and amazing production capacities herald an evolution in both production and profit opportunities. Max Page Size: 13" x 19"